If you're an interior designer; decorator; architect; set dresser; picker; collector; or homeowner looking for the right accent to highlight your personality - we think you'll find something cool here. Click the link or picture of any listing for alternate and expanded views. When you look through a retail catalog with retro furniture, industrial design, steam punk, found sculpture & reproductions, you'll see a few of the same items we had collected with the idea that we might make something wonderful with them. We kinda realized that we probably wouldn't get to a lot of them, so now we're offering them to you at a fraction of what you'd pay from some fancy retail Fifth Avenue store or catalog. We knew they were cool when we picked them up and catalogs & showrooms think so too. The ONLY catch is that YOU have to clean them up and figure out how to mount or hang them. And of course, we'd be happy to brainstorm with you with suggestions on how to make it all come together. And new in 2012 we're offering a few TagYerit artworks made from some of those findings mentioned above! Like New old stock - never mounted or used. 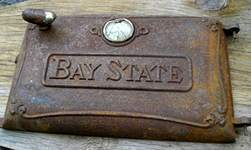 Stamped on one end: " For Ames Plow Co. Boston, Mass. - 1 Doz. 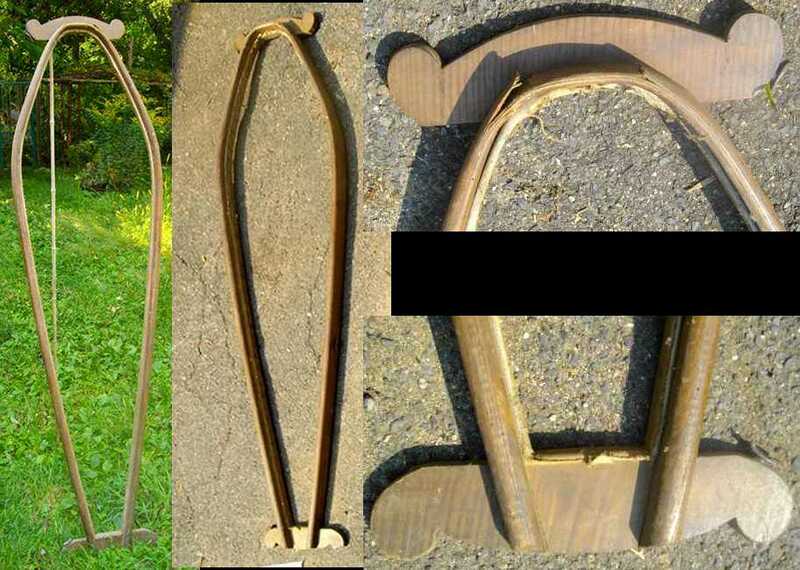 Sharp Scythes - Solid Steel - 34 B 36"
On one side it's stamped: "Patent Solid Steel"
On the other side is painted H. M. Thompson Amherst, Mass. (An HM Thompson shows up on a web search as a graduate of UMass (i.e. Mass Agricultural College) as class secretary 1892. The inside has the partitioned wood that would have held the scythe blades. One is complete though it has a split. The other is missing the middle piece of wood, which I whittled out a quick patch. I also added a few boards to use as shelves (see pictures). They are just tension fit, so they're adjustable. I would recommend a few nails to secure them, but it may not be necessary. From the stuff I scraped from the inside, at one time someone used this to store (or mix) plaster and / or mortar. Other than the shelves and patches described, I'm selling it as found. This would be great as part of a hardware store display or a nice niche cabinet for that hard to fit space. Could hold CDs, DVDs, a few folk art objects etc. Sorry, the items pictured on the shelves do not go with it, though if you ask, I will send along our band TagYerit's CD with it. 40" X 7 7/8" X 6 7/8"
This is a 19th century saw that probably saw many years of use and when the handle broke, a coppersmith craftsman, in order to preserve its usefulness turned it into a true work of art - possibly as much as 100 years ago. Since then the saw blade has seen its share of rust and it also has a crack and can no longer be used as it was originally intended. Still the workmanship on the repair is a mark of the skill and design sense of the unknown coppersmith. Three pieces of copper were bent and shaped to follow the contour of the back edge of the saw blade and the curves of the walnut handle. Four copper rivets hold the copper to the blade and 4 screws hold the screw to the walnut. Made expressly for T. S. Stewart & Co. This is a crosscut handsaw - I think it is, though it's hard to see the bevels. I don't know if the current tooth pattern was intentional to the design or through lack of proper sharpening, but it seems that every alternate tooth is lower. The saw is approx. 20" long and the blade is approx. 17 3/8" long. 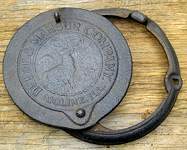 Patent date 1867. 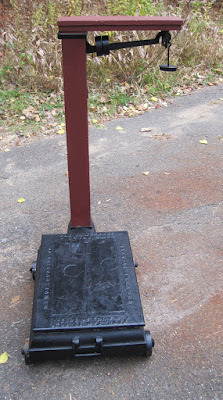 The Brandon Manufacturing Co., manufacturers of Howe Standard scales. The Brandon Mfg Co. operated approx. 1869 and moved from Brandon VT to Rutledge VT in 1876. I repainted it, but otherwise, it's just as I found from the barn of an old farmhouse that originally had a small dairy. Still in working order with 2 weights. 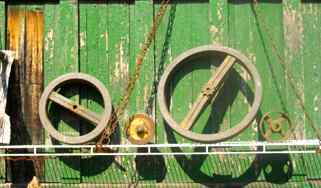 One of the iron wheels is rusted frozen, but I suspect it can be freed up with a little WD-40. This is the type of scale that may have weighed grain. Great for contemporary Industrial design. Or set a large house plant on it. Top cross beam is 20" across and the width tapers from 5" down to 3 3/4" End of top beam stamped on one end. Patented May 24, 1859. The other end is stamped 36485. 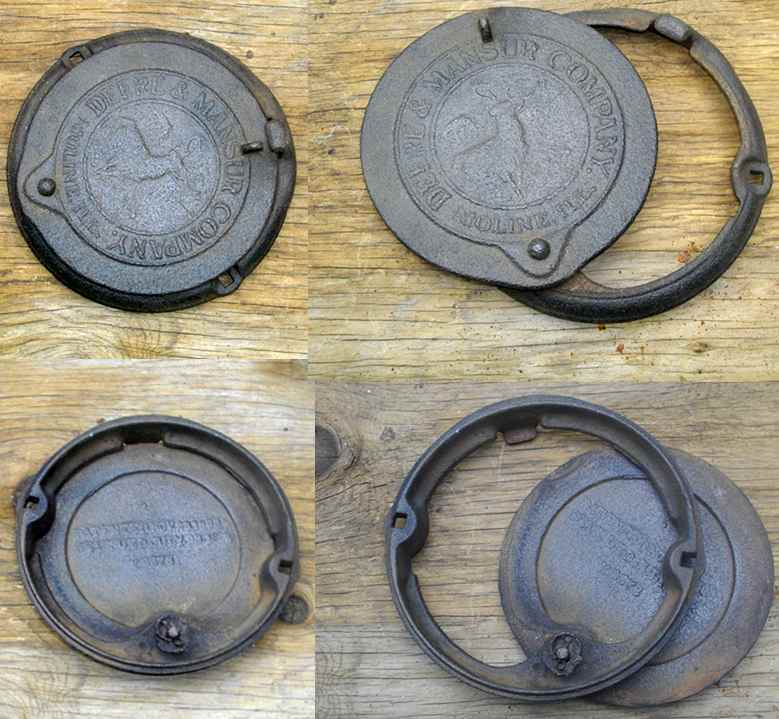 Attached on the upright wooden post is a 3 1/4" diameter round cast iron plate: "Howe Scale Made by Brandon MFG CO Brandon VT"
The cast iron step on plate is 16" X 24" with a wood rectangle in the middle. There is a crack on one corner, which had been repaired with 2 rivets and a steel plate. 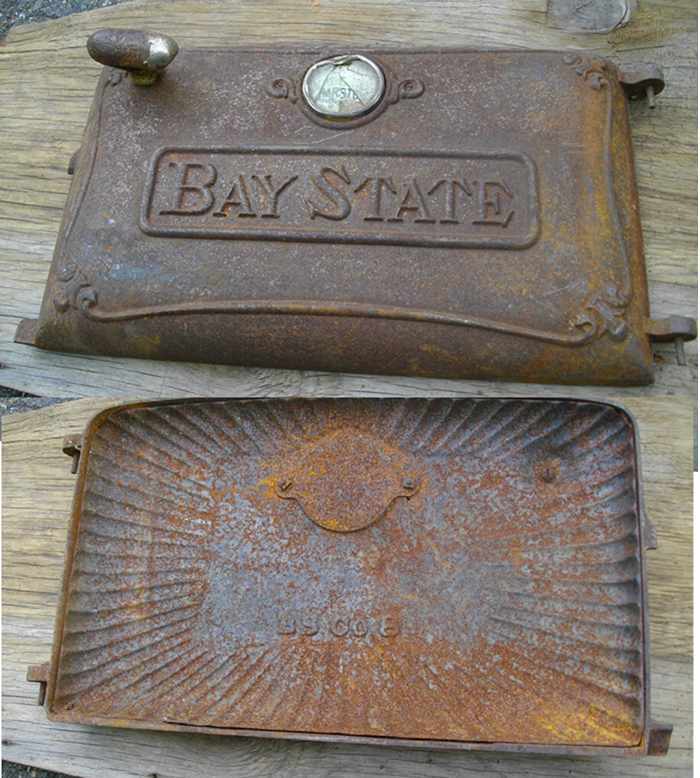 (see detail in photos) The casting says "Made by Brandon Manufacturing Co. Howe Scale Brandon VT #9 Patd. Jan. 15, 1856 & Aug.30, 1867"
Overall it is approx. 36" X 19"
In original condition. 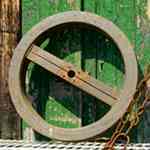 This wheel was used with a flat belt to run machinery. The cross support piece is probably oak. The wheel is probably pine. The iron gear mounted in the center has 9 cogs. 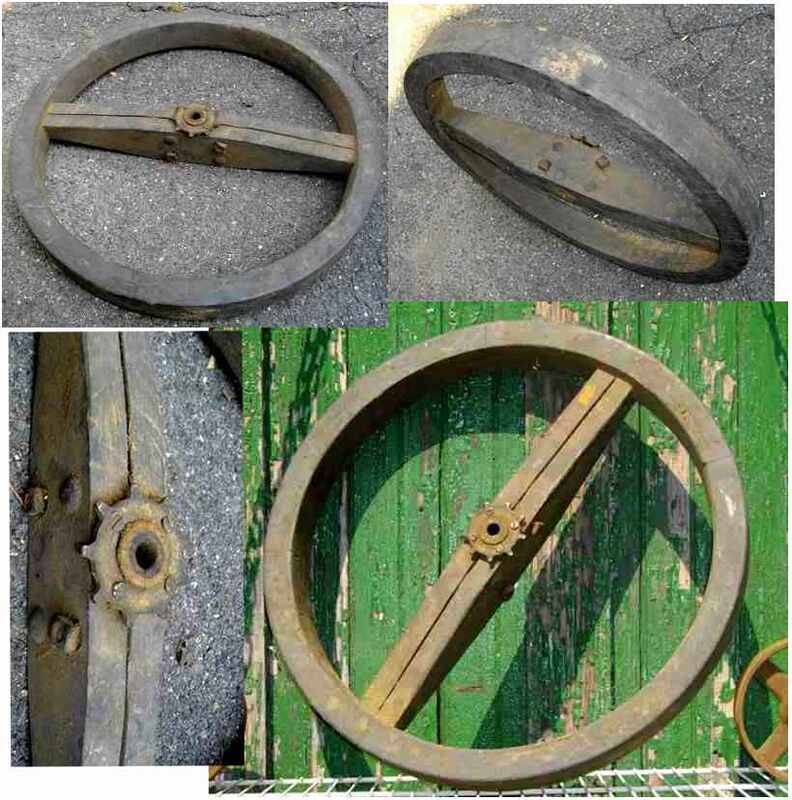 Dimensions: The Wheel is 23 3/4" diameter & 2 1/4" deep (overall depth including iron gear is 3 3/4"
In original condition. 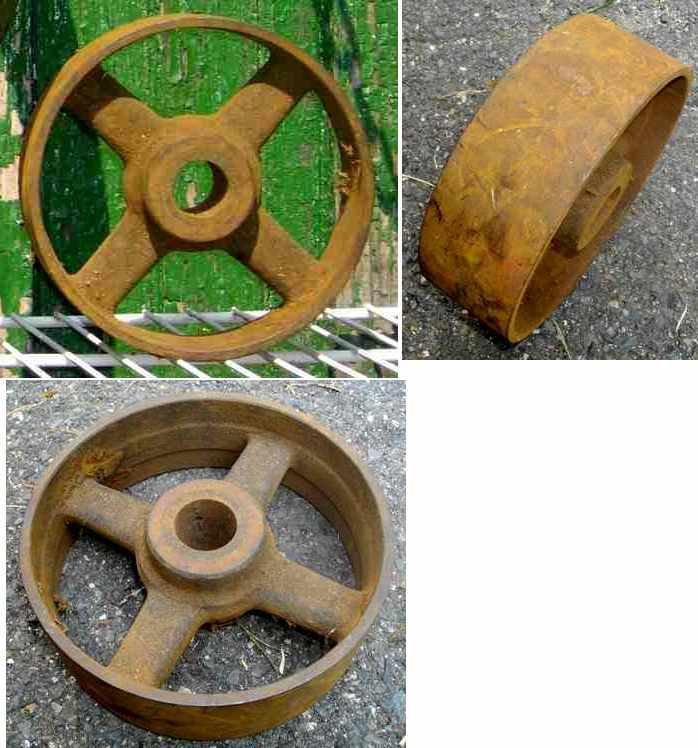 This wheel was used with a flat belt to run machinery. The cross support piece is probably oak. The wheel is probably pine. 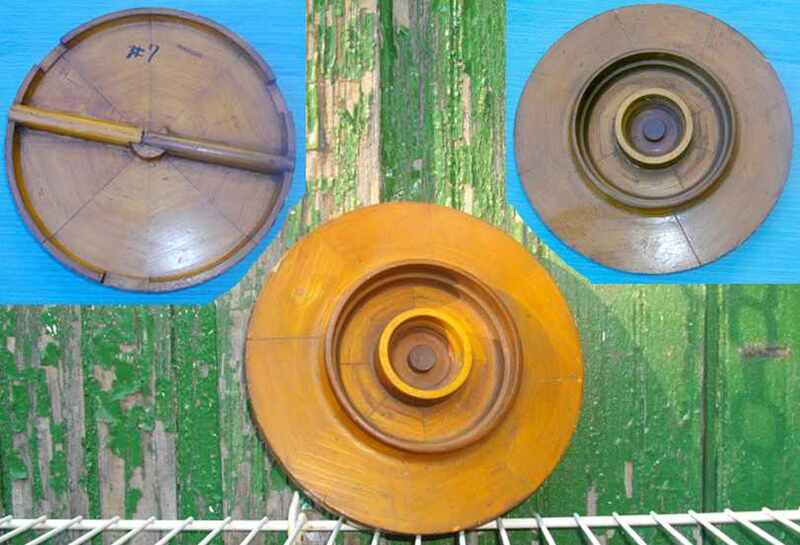 Pine flat belt pulley wheel with iron center. Good for display only. This will no longer function properly. The skill required to make this type of wooden mold is quite fascinating. The main disk (8 1/4" diameter) is built up of eight pieces that are shiplapped (stepped) so that on the face of it they converge at oblique angles, yet when you look on the other side, you can tell that they were made from 8 isosceles triangles. I've been dabbling as a woodworker for 40 years and this degree of artisanship still amazes me. On top of this disk are laminated 2 wooden rings. 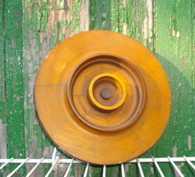 The outer ring with the darker color is 4 5/8" diameter. The inner ring (2 3/16") is finished with a lighter color. I presume this is made from a soft wood such as pine or poplar. The colors in the picture of the mold with the green background are more accurate than with the blue background. 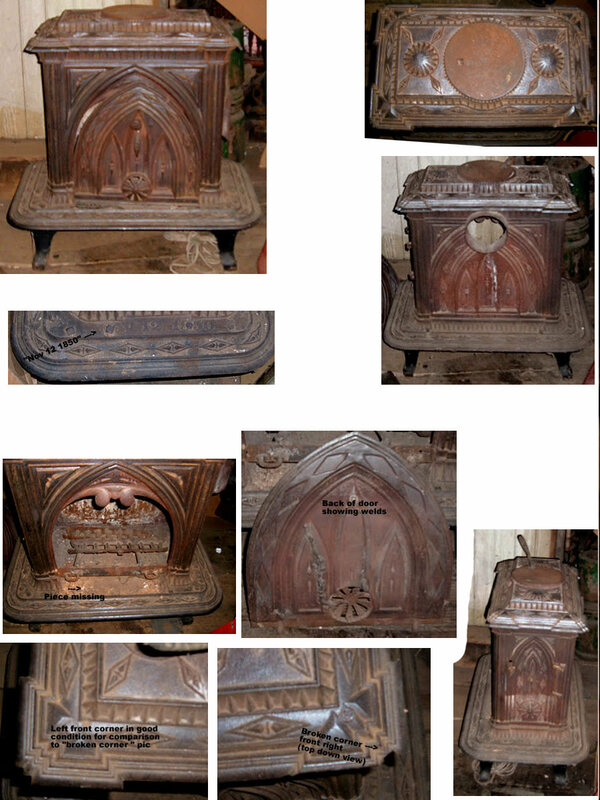 <-- Click image to left for more pics We are selling this "as found". But what is it? Best guess so far is that it might have been part of a portable sauna or steam bath (spa?). It is made of 7/8" oak bent into an oval shape. There is a strip of wood inside that has the remnants of the original canvas. The top and bottom slats look to be a figured wood - possibly maple or sycamore???. At one time, it had 6 iron tie downs around the perimeter. Four remain (2 are missing). This would make a great mirror frame or a portal doorway into another dimension. Imagine Alice walking through the looking glass. Willing to discuss delivery within 100 miles of Amherst, MA. - If you are near a Greyhound bus terminal it may also be feasible to ship via Greyhound PackageXpress . Contact us if you'd like to discuss this or other options. It has two square holes to assist in mounting it. It would make a fun secret frame to cover a round mirror, a picture, or a small safe. There's a spring in the pivot pin that though rusted still holds the door in partially opened position. DIMENSIONS: Door overall diameter is 7" Outer frame dimension 8 1/8" x 5/8" Overall thickness is 1 3/4" including where the handle and pin protrude. One small obstacle to overcome in mounting, is the 3/8quot; protrusion of the spring pin in the back. You'll be the only one of your friends with this conversation piece. You can explain how one time farmers had to till the soil by hand over the "Oohs" & "Aahs" of admiring friends. It's fun to spin the wheel. We set this up one time to play a pickup game of our own version of "Wheel of Fortune." DIMENSIONS: Wheel diameter 15" x 1 1/2" deep overall size is 23" x 10"
Shipping weight is 13 lbs. <-- Click image to left for more pics Judging from the crooked dented thermometer, someone must have forgotten to open the door before trying to throw in a log. Besides actually incorporating this in to your next fireplace design, you could also mount it as a cabinet door. We hung a similar door to hide a secret painting. The scalloped cast iron liner is made as a separate piece. Marked "BS Co. 8" - This could be removed to become it's own "found-art" piece. 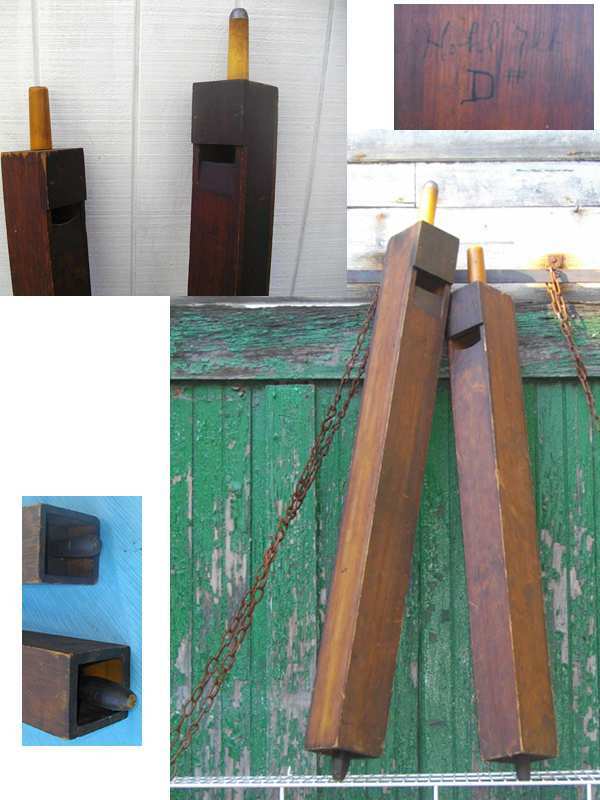 DIMENSIONS: 11 1/" high X 20 3/8" wide (overall - includes hinge on right and bottom left nub). The handle is 2" deep & 3 1/8" long. It still has a small amount of the original chrome finish. 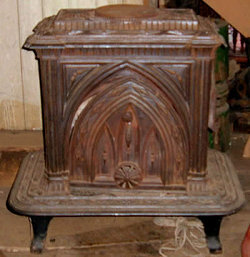 <-- Click image to left for more pics This is a beautiful old cast iron gothic victorian wood stove with cathedral shaped castings. "Patented Nov. 12, 1850. It has a cleanout door on the right side. Someone did some work on this a while back. There are weld repairs in various places, including the front door (on the inside -pictured) and on the left side and the back. I don't believe the lift-off lid to be original to the stove. The bottom panel that originally held the front door in place is missing and someone adapted a fire grate to hold the door in place. Selling this as is. Pickup or will also consider delivery within 50 miles of Amherst, MA. Contact us if you'd like to discuss any options. I've photographed these 2 wooden church organ pipes upside down so you can see how much they enjoy harmonizing together. But in reality, what is shown at the top where the air would be blown in is referred to as the foot. It would be nice if someone restoring a church organ actually needed these pipes, but until then, they would look great positioned on a wall in your music room to show off their singing prowess. Alternately you could display them horizontally and you'd have 2 nice shelves for your CDs or narrow collectibles. The shorter pipe foot is 4 3/4" long. Its pewter cap was removed some time ago. 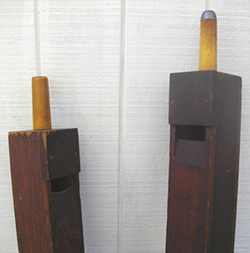 The box part is 5" x 4 1/8" x 40 7/8" long for an overall length of 45 5/8"
The stops which act like a plunger were used to drop the pitch of each pipe by an octave. Shipping: Due to their length, there might be a surcharge or shipping restriction. I estimate the shipping weight to be 19 lbs. with box size of 54" X 12" X 11"
A pitman is a connecting rod in machinery. 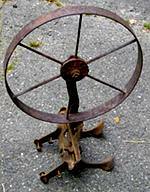 This cast iron pitman is from a Wilcox & Gibbs treadle sewing machine. This would make a great pivoting long-arm plant holder unless you insist on mounting it flat on a wall. The casting says "Wilcox & Gibbs Safety Pitman Pat. Jan 25, 1870"
The larger circle with the identifying information is 4 3/8" outer diameter (4" inside the rim). The overall length is 10 1/4". I think the holes on either end would take (fit) a 5/16" pin. I'm imagining a piece of circular plate glass with center hole fitted over the writing for a larger shelf. 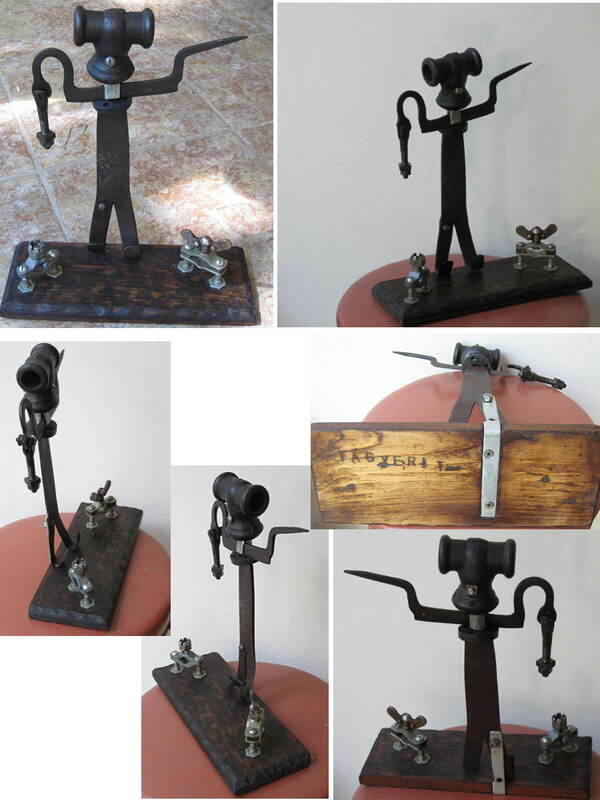 Works we've created that we're offering for sale: some from old parts: others from scratch. Rusty, the tall guy in the center is made from pieces of unknown origins. 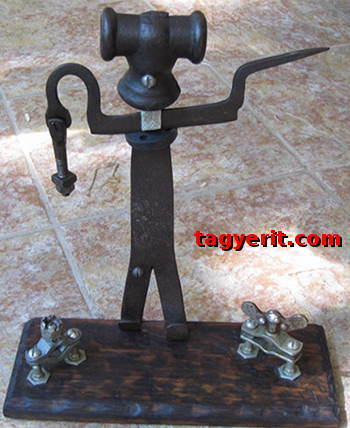 His head is made from an old vise handle, but his body came from who knows what, and his arms look to possibly been a draw (spoke) shave, which was originally made from a file. He has a rubber shoulder collar and the neck is from galvanized pipe. To his right (your left) is Nutsy, a reformed cable grounding clamp, now adorned with a castle nut (castellated) crown. And to his left (your right) is crusty, another cable ground clamp with a wing nut head. These 2 little guys are standing in t-nut boots. For another idea for how to use some of these pieces, such as some of the circular items shown here, check out our Gadgetree page which has several designs incorporating graduated sized circles made from hoops or music records. For your convenience we've provided a PayPal Buy Now Button for many of these items. But if you are interested I'm more than one item, or if the item does not have a PayPal Button, then contact us to discuss various options. Paypal makes it easy to figure shipping costs. They will provide you with the final shipping costs before you actually purchase. Another option is to contact us telling us what you're interested in along with your address and we'll give you the final price. TOOLS great design elements here too.